Whysong’s Pharmacy is located in rural Pennsylvania at 4186 Cortland Drive in New Paris, PA. David N. Whysong, R.Ph., built his first 1600 sq. ft. pharmacy in October of 2003. Located in the medical arts complex, it did not take long before he determined that more space was needed. In the summer of 2007, Weissang, Inc. voted to build a 4,000 sq. ft. retail pharmacy directly across the parking lot from its previous location. Whysong's Pharmacy offers a wide range of OTC medications & treatments, Yankee Candle Corner, large Gift Gallery, refreshments, Kodak Digital Picture Machine, Lottery and so much more. The staff at Whysong’s Pharmacy is dedicated to improving their customer’s lives. We will always greet you with a smile and make your shopping experience an enjoyable one. Our experienced staff knows how to make your day better when it comes to filling your prescriptions, educating you on treatments or finding that perfect gift. Each employee is vital to the success of this company, so we would like you to meet each one and encourage you to stop in and say “Hi”, and see why our staff is so awesome. 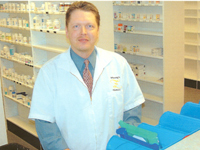 David attended the University of Pittsburgh School of Pharmacy 1994. Tammy has been employed with us since May 2015. Jeff has been employed with us since May 2008. He is dedicated to providing excellent patient care.